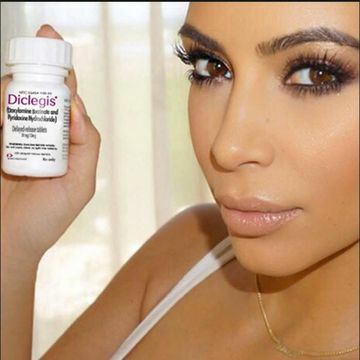 The FDA slams makers of anti-morning sickness pill Diclegis, promoted by Kim Kardashian, for not sharing med's side-effects. So is it really safe for pregnant women? The U.S. Food and Drug Administration is upset with Kim Kardashian, not for what she said, but for what she didn't say regarding a morning sickness medication she shilled on a now-deleted Instagram post. "OMG. Have you heard about this? As you guys know my #morningsickness has been pretty bad," the soon-to-be mom of two wrote in June after revealing her second pregnancy. "I tried changing things about my lifestyle, like my diet, but nothing helped, so I talked to my doctor. He prescribed me #Diclegis, and I felt a lot better and most importantly, it's been studied and there was no increased risk to the baby." The problem, according to the FDA, is that Kardashian's post didn't specifically describe the potential risks—like an accelerated heartbeat, dilated pupils, confusion and drowsiness—that come along with taking Diclegis. She did point fans toward the maker's website for more information, but that, according to the agency, isn't anywhere near enough. That's not to say Diclegis is inherently dangerous for many pregnant women. The FDA-approved med is actually a combination of two drugs used by many doctors to help women through the nauseating first months of pregnancy: pyridoxine hydrochloride, a form of vitamin B6, and doxylamine succinate, an antihistamine. "It's the ideal first line attempt at abating symptoms," OB-GYN James Betoni, MD, tells Fit Pregnancy. "Until Diclegis was released, many providers would recommend that patients make their own by taking vitamin B6 with a Unisom SleepTab." Not into immediately adding a medication to your daily routine? There are plenty of safe, natural treatments for pregnant women, but exercise caution and talk to your doctor first. "I caution patients who are very set on natural alternatives as many have not been studied in pregnancy for obvious reasons," Betoni says. Working ginger-based drinks, like herbal tea, to your daily diet is a good place to start. "Other flavors of teas—like chamomile or peppermint—can also ease symptoms," Betoni adds. Also pinpointing what makes your morning sickness unbearable can help your doctor recommend effective treatments. "Sometimes I find that some activities of daily life—like brushing teeth, certain smells or swallowing prenatals—can cause nausea and vomiting," OB-GYN April Schiemenz, MD, tells Fit Pregnancy. She says that adjusting your diet is the first way to beat the first waves of sickness. Foregoing the greasy, fatty stuff for a BRAT diet (bananas, rice, applesauce, and toast) is helpful. "Contrary to what you would think, eating a little of something bland regularly can help avoid nausea and vomiting." If all that doesn't work, then medications like Diclegis can help—if recommended by a doctor, not a reality star.